When JEA set out to rehabilitate 300 miles of deteriorated sewer pipeline using pipe bursting and other trenchless methods, a second aspect of its service area was also addressed. As poor as the sewer lines were, the manholes weren’t in much better shape. Amongst the 3,000 miles of sewer lines in JEA’s service area, there are approximately 60,000 manholes. Of those, approximately 6,500 were deemed unacceptable and designated for relining. JEA officials use the same language to describe the manholes as they did for the sewer pipe – none of which are positive terms. As with the sewer lines, the majority of the manholes are in the older sections of Jacksonville and its surrounding area and are approximately 50 years old or older; they are primarily made of brick or pre-cast concrete. Comparing the condition of the sewer lines to the condition of the manholes, not much of a difference can be found. “They were just as bad as the pipes,” said Ken Crawford, JEA sewer maintenance manager. “The mortar in the manholes was chalk; it held the bricks in and the bricks were falling into the inverts. When the guys would jet the lines to pull the bricks up the lines, we would get jet heads hung up in the bricks. Then we would have to dig those up. It was just one thing after another.” But before any relining of the manholes could commence, there were additional problems that needed taken care of first. When JEA Decided To Do Something About The Condition Of Its Sewer System, Some 6,500 Manholes Were Also Included In Those Plans. JEA contracted with CCI Spectrum to reline some 6,500 manholes as part of its sewer rehabilitation project. 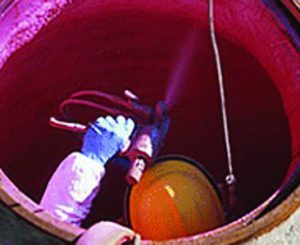 Using the SpectraShield process, only about 500 manholes are left to be relined. Here, the before and after is shown. Jacksonville-based CCI Spectrum Inc. was formed in 1989 by Jamie Hume to develop and provide solutions for the aging wastewater systems in the United States. Hume grew up in the resin and plastics business, working summers and after college for his father’s business. After several years, he went on to work for a local underground utility contractor where he learned of the corrosive environment in wastewater systems. After a few years, Hume started his own business in 1989 and began research and development on the latest resin technologies. He developed products to suit the requirements of the wastewater environment and was able to provide owners with a warranty they could depend on. In 1993, Hume introduced SpectraShield. Rhyne said the lining system is a multi-layered stress skin panel system composed of a moisture barrier (a modified polymer), a surfacer (a polyurethane/polymeric blend foam) and a final barrier coat (a modified polymer). “[Hume] saw the number of problems that existed in sewer rehabilitation and the deterioration of both concrete and brick structures due to hydrogen-sulfide gas and all the elements that take place in the collection system,” Rhyne said.